coins destined for the market. 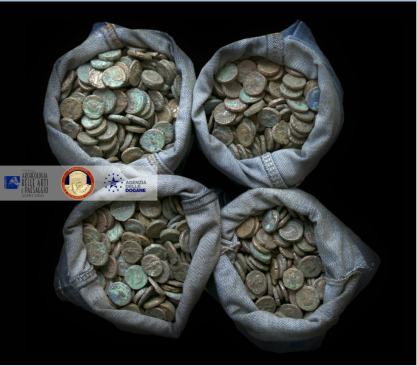 Italy returns 23,000 coins and 195 archaeological finds to Egypt seized in May 2017, by customs authorities as part of a Carabinieri_ investigation in Salerno, Italy. 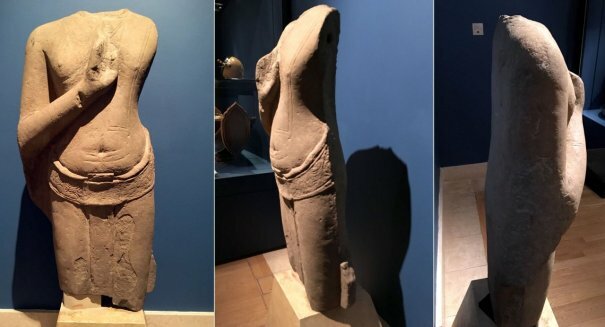 Italy Returns Trafficked Artifacts to the Archaeological Departments of the Ministry of Antiquities of the Republic of Egypt ARCA Blog Friday, June 29, 2018. The pieces were discovered during a seizure which took place in May 2017, at the customs area of ​​the port of Salerno, by the Carabinieri of the Cultural Heritage Protection Center of Naples, in collaboration with the officials of the Customs Agency and the local Superintendency. The stop, was part of a customs inspection of a container which was marked as being for the transport of only household goods. Readers might remember the fuss the coineys made when the US was about to sign a cultural property agreement with Egypt, they suggested that so many ptolemainc coins were struck and circulated outside modern Egypt that there was no need for the US markety to be supplied in them from Egypt itself (so the agreement should exempt coins). Well, here are several sackloads of coins found going from Egypt to the international markets with the involvements of some criminals on the way. When are the coineys going to stop their destructive obstructions and settle down to cleaning up their grubby market? 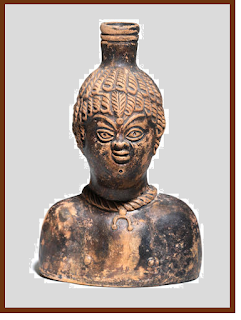 In the form of a bust of an African, depicted with tiers of short ringlets, the face with lidded eyes with recessed pupils set beneath arched eyebrows, small nose and mouth, and pronounced chin dimple, wearing a collar with crescentic pendant, with short spout and ring handle at the back, remains of black slip overall, 16.2cm high FOOTNOTES Provenance: Jan Willem Salomonson (1925-2017) collection, the Netherlands, acquired prior to 2000; and thence by descent to the present owner. Which is rather odd, because this here seems to be the same object on sale recently elsewhere... where it seems to have been dated to the 1st century AD. What is even odder is that fabric, some kind of slipped ware, but which production centre? Rhenish? Nene Valley Ware? Central Gaulish Black Slipped ware? Colchester colour coat? 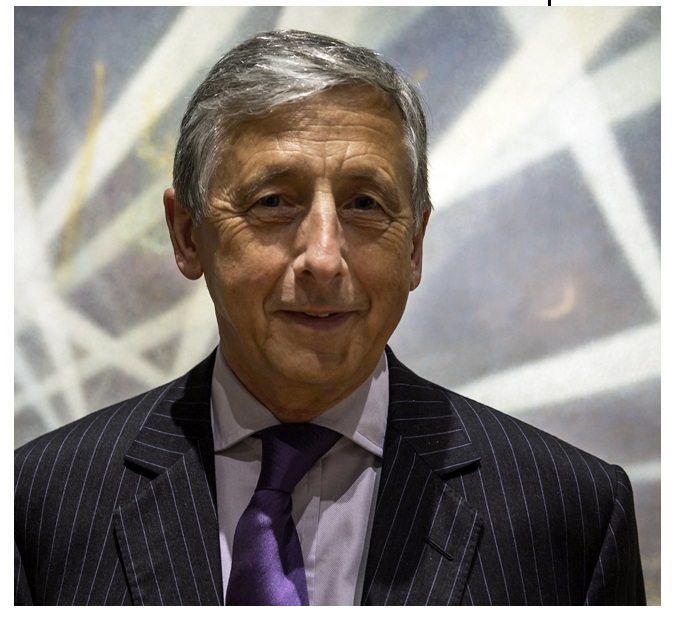 Why do not Bonhams say? Surely they could easily find a Roman pottery specialist to give it look-over. There are lots of them in England, and even in London. In particular, parallels (if they exist) would be easy to find, as this vessel is mould-made (which Roman colour-coat vessels tended not to be). So why is Bonhams not more precise about what it actually is? Another interesting feature is the rim. This vessel is a skeumorph of the much more common glass head-flasks (which sometimes also depict African features, though never as caricaturish as here) but then why does it not have their flaring rim (like this pot)? Why did it need a 'ring handle' (sic) at the back when a flask this size can be handled without and the glass ones do not have them? 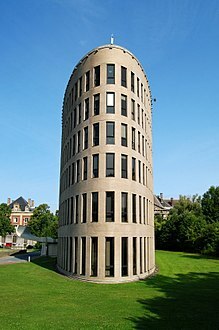 What was the function of such a vessel, apart from just being ugly? How would you pour from it? 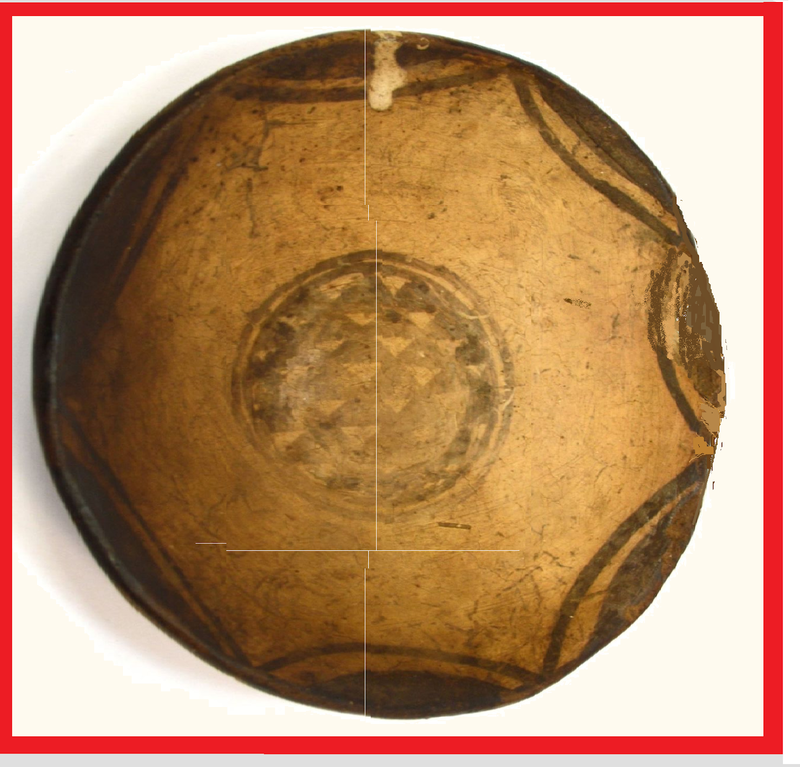 Any Roman pot people out there want to give Bonhams a hand and share a few parallels? Lots of questions left unanswered by the skimpy description. As usual. Caveat emptor, I'd say. PS Bonhams, the word is 'lunula/lunular'. Byzantine Empress Theodora died #onthisday in AD548. Originally a dancer/courtesan she rose to become (arguably) the most influential woman in Byzantine history. 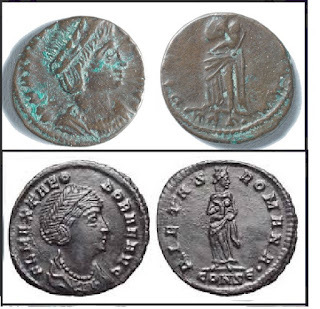 #girlpower #thisgirlcan CC.918 Copper coin depicting bust of Theodora. Except the coin shown (top) is what seems to be a badly chemically-patinated cast fake bearing little resemblance to real coins (bottom) of any empress Theodora - and they've got the wrong one anyway. This one (Flavia Maximiana Theodora) was the second wife of Constantius I and dates to the fourth century, not the sixth. You would think the FLO would know the difference, but he retweeted it too. Heritage professionals misleading the public. I suppose if you've got nothing better to write about, this will have to substitute for it. What this is is using archaeological artefacts as illustrations of historiography and not as archaeological evidence (this is precisely what is behind that PAS 'artefact collecting is citizen archaeology because archaeology is digging up old things' model that I find so dodgy). 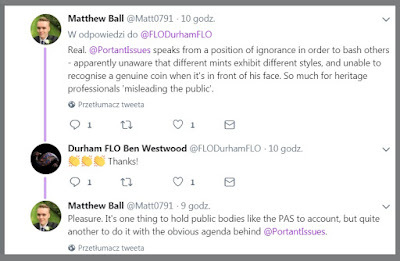 If Mr Westwood would look at the PAS aims, and see whether the Scheme is for talking about archaeological context or illustrating history books, perhaps he'd not lose sight of the fact that the liaison he's paid to do is of a different character. 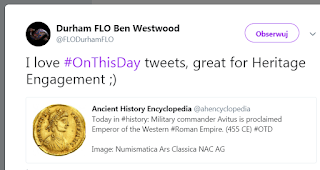 Well, I am not retracting anything, the FLO in his 'heritage engagement' with the public was misleading them by disseminating a post presenting a fourth century coin as one minted in the name of a sixth century empress (the one who died 'on that day'). That is not libel, it is however a fact that undermines the PAS's credibility. I personally think archaeology consists of a little bit more than disseminating 'nice pictures and nice sentiments'. I have no idea what Garstang Museum think, they have not responded to my request for information where that coin came from. 'badly chemically patinated cast fake'......please [...] I'm no coin expert (& never claimed to be, clearly you're not either...) so maybe @Matt0791 will confirm: badly struck or poss a contemporary copy? Since coins make up a considerable portion of the 'metal detected' finds selected by artefact hunters for recording by the PAS (and in other databases), it seems to me that employing somebody as an FLO that is not knowledgeable about this kind of object is a mistake one that could compromise the database now finds records are being verified much less than they were in the Scheme's early years. Mr Westwood may assume that I am 'not a coin expert either' but I guess the fact is that of the two of us, when I saw the coin that he had perceived as a 'nice image', I realised at once that it was not what it was being marketed as. But the FLO retweeted the 'nice sentiments' (wishful thinking) without checking. Again, what is going into that PAS 'database' in Durham? But as asked, along comes Matthew Ball from the Department of Coins and Medals of the Fitzwilliam Museum. 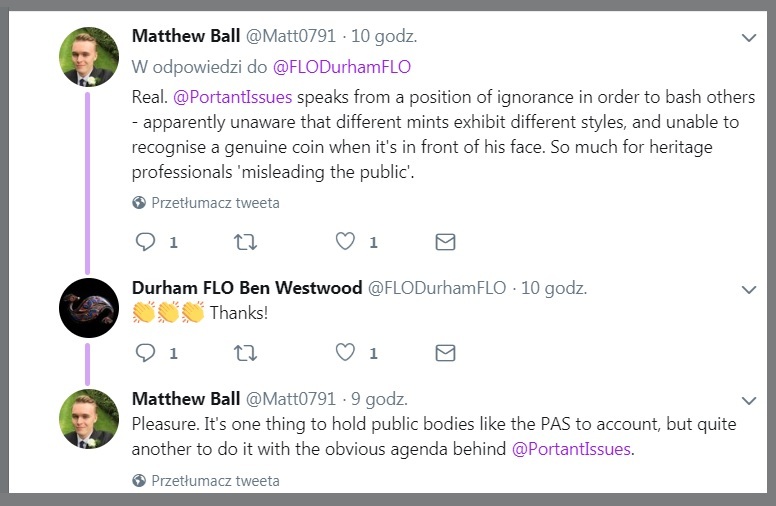 He says the coin highlighted by the FLO is "real" but then adds some more comments about my 'agenda'. Leaving aside the fact that the blog I run has indeed several agendas, which is why it is here, let's have a look at why I am less than convinced still - despite what the coiney (who of course will have no agenda) asserts - that it is 'real'. Now here's a nice thing for all you coin collectors out there. A bit of education. 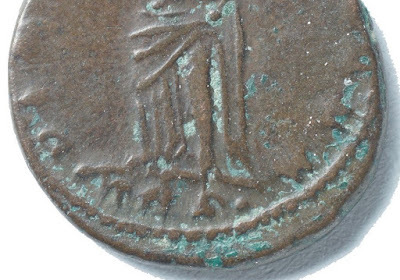 Dealers and collectors, if you have a coin that looks like this with blurry details, the relief portions merging with the field, a poorly-formed and uneven inscription apparently understruck all round and 'worn', but the details elsewhere more intact, the design curling round the flan edge and with patches deliberately left of that very dodgy even, clean, waxy green deposit right on the oxidised surface.... and you thought it was a distressed fake, good news. Matthew Ball from the Fitz will apparently write you an opinion on the basis of the photo that its a pukka real coin and you can flog it as such on eBay. But I feel a dearth of education from this Museum professional. I'd like him now to give us the reaction equations how he thinks that a corrosion product sequence like the one we see here formed if he is telling us that his 'real' object got like that from being in the ground. I've seen this 'patina' before, but not on ground-dug objects. Dr Ball might see it in collection trays - but are any of the objects that exhibit it actually 'grounded' with real paperwork? And the picture below: looking like this is not due to this object being cast according to Mr Ball, its due to it being "real". Those wouldn't be air bubbles in the exergue would they? Mr Ball would have us believe, I guess, that this is localised corrosion pitting, but again, I am interested in learning from him how such a thing could happen to a coin in this general condition - and a very interesting condition if is is a properly grounded object recovered from an archaeological deposit. Is it? Mr Ball says it is. [...] why on earth would anyone go to the trouble of forging a Cu coin worth at best about 15 quid? Take it on the chin, listen to the expert, admit you're wrong. I am waiting to be educated why I am wrong. Mr Ball has still not substantiated his verdict in light of my questions. I am still waiting for a more substantive answer from Mr Ball. Tell me, the Garstang coin, cast or struck? Why 'real' and not modern meant to deceive? Here characterising the corrosion seems pretty vital. Heritage engagement please, answers for a 'layman'. Still unanswered. Without that, I cannot judge if he is right or wrong when he issues from above the one-word verdict "real". To me the coin looks like a cast copy, and that corrosion looks like a modern chemical 'patina' made to look like this is a badly cleaned earth-dug find. Go to a reputable dealer, ideally a member of The International Association of Dealers in Ancient Art or The Antiquities Dealers Association and to visit their websites to look at the codes of conduct. My advice is to ask the dealer about the provenance of the piece with supporting evidence. For objects in excess of €5000, dealers will check against a stolen art register such as the Art Loss Register. And of course the would-be collector is told that 'buying through a reputable dealer' will help you steer clear of replicas and fakes. Yes, except where the dealer has bought a fake artefact and cannot tell the difference because the objects he'd compare them with are also ungrounded fakes of unclear origins. The annals of collecting are full of this kind of thing, like those indicated by Muscarella, a whole series of small items coming out of Bulgaria and so on. * which is odd to mention in the context of the antiquities trade, RBC is committed to supporting strategic initiatives that make a measurable impact on society, the environment and the economy.What, like collection-driven exploitation of the archaeological record? Ixelles scores an own goal? The server is experiencing an unusually high volume of requests and is temporarily unable to process your request. Please try again in a moment or two. the object from it from their database? I remarked to the editor-authors of the long article defending liberal laws on Collection Driven Exploitation of the Archaeological Record that it was unfortunate that their dismissive attack on Sam Hardy's conclusions that such liberal approach and the archaeological response it engenders in England and Wales came out on the very day that HE began a campaign using metal detector holes appearing near a section of Hadrian's Wall at Brunton. Oh, that does not matter one of them says, and claims I am so 'ignorant' to not know that the PAS 'works very closely with HE on this issue' but 'I don’t feel I need to say more to you on this, especially as you don’t really understand or appreciate the role of the PAS in the fight against heritage crime'. to what extent can they show us that before handling these objects, they obtained documentation (finds release protocols) for each of them verifying the finder's claims to have title, and confirming that each of these objects actually came from the property of the landowner they say they did? Do they archive copies of this documentation so future researchers can recheck their validity should they so wish? It would be easy for a piece of (say) showy cavalry equipment dug up from one of the Roman forts in northern Britain to be presented to the PAS as from a farm (say) 52.91 kilometres to the west, well away from the site of discovery and in a landscape context where such a find is very much out of place. 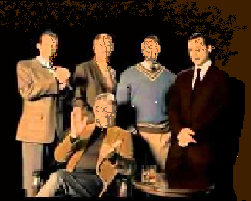 Without any documentation confirming that declared findspot, nobody would be any the wiser, the detectorists could display the objects to their admiring mates and dispose of them by sale safely, but a fraud would have been committed (with the PAS complicit) and any researcher using the false data would be using fake data. This after all was one of the recommendations of the Nighthawking report. So are the PAS actually implementing it in their 'fight against crime'? Or are the objects and unverified data being entered willy-nilly onto a database in which one can therefore place very little trust? Just saying. And what about those odd out-of-place finds? Is there a secret archive of "I recorded this but suspect the finder is lying" (or maybe "A finder brought this to me but I refused to record it because I suspect he is lying, watch out for this one")? How big is it? "Harappan pottery dish c.2500-2000 BC"
And the stealing continues today. While it is true locals are complicit in illicit trade in art from Pakistan and India, it is encouraged by art dealers based in Europe and the USA. The plunderer in Swat gets a pittance, the final buyer pays millions for a rare millennium old art piece, and the dealer makes all the money. It is estimated that 90 percent of the South Asian antiquities on sale in the London auction market are illegally smuggled.[...] Islam is obviously not against local cultures, even when those cultures are not Islamic. But the lack of economic development, coupled with corrupt officials and murderous extremists, have stolen from our societies our past relics of social harmony and cultural exchange. 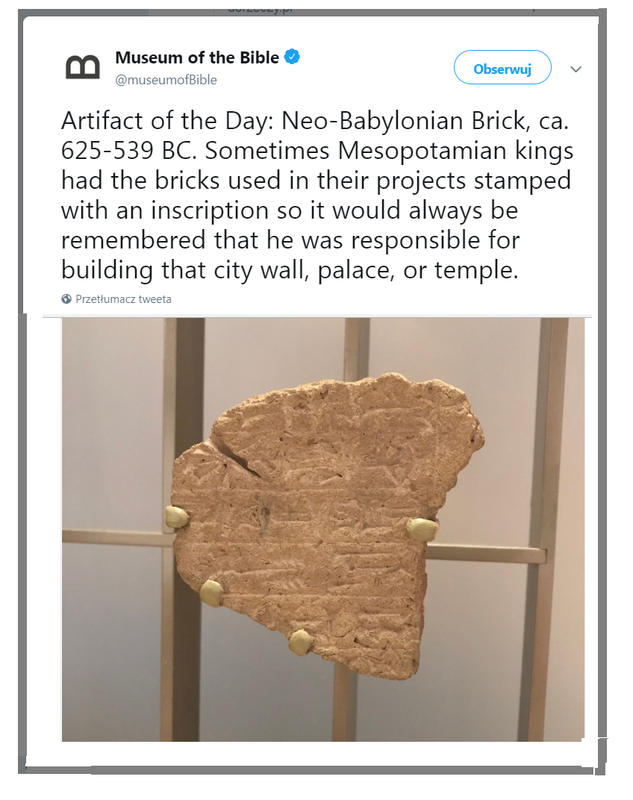 Collectors will argue that 'we" (that means archaeologists) should be doing more to create economic development, remove the corrupt officials and murderous extremists. Obviously the dealer who makes all that money on the antiquities market is not fuelling that economic growth and the collectors' money that goes into the pockets of corrupt officials in the form or bribes to turn a blind eye and murderous extremists to stop them murdering the smugglers, is not going to undermine either of those two groups. Type "Indus Valley" into eBay now and see what you come up with, and that is just one of the cultures that this land supported down through the millennia. Then look how many of them are being sold in the UK (more of which later)... the illustrated one is from a US seller. No collection history or export licence details given. Ixelles Six: "Discouraging 'the Ignorant' from Forming an Opinion Opposite to Ours"
there will be people (ignorant in these issues), which we know to be complex, taking what is presented at face value. We thought we should highlight what we see to be incorrect. But without actually addressing the fundamental issue Hardy highlights, but attempting to dismiss it as unimportant (they hold p. 323 that it is 'fundamentally wrong' to say collection-driven exploitation in any way damages the archaeological record). 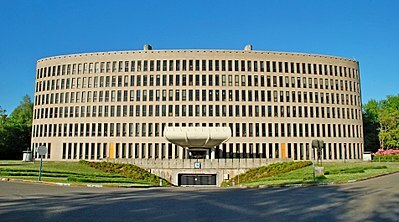 The pro-collecting gang gathered around the corresponding editor at the Vrije Universiteit Brussel (VUB) merely dismiss those who consider that there is an issue to be discussed (first brought into the public domain by the grassroots organization Heritage Action's Artefact Eroson Counter) as 'people ignorant in these issues'. That is the height of academic ivory tower arrogance. It remains to hope that when Britain is ignominiously thrown out of the EU in a few months, the legacy of PAS in Europe will fade and it then will be easier to vincere tenebras by real academic discussion, and be able to put behind us the posing and sniping of those who have dominated the discussion so long, shouting down the 'detractors' (sic) who apparently are dead set on defending their 'Treasured' status quo from being questioned and being held actually accountable for the damaging effects it has caused for so long. Thanks for your reply, at least one of you did. But I am not sure I appreciate the tone of this:"I don’t feel I need to say more to you on this, especially as you don’t really understand or appreciate the role of the PAS in the fight against heritage crime". an excellent example of the typical form of PAS 'outreach' there. Written in the usual dismissive style typical of a true metal detectorist! I am sure we’ll come back to that another time. "Our issue with the Hardy paper is in relation to poor methodology and some basic factual errors". No it's not, it's because it raised the question of the figures that the PAS and its supporters in twenty years of trumpeting its Propaganda of Success have not been able to contemplate producing, the number of items that are removed from archaeological sites and assemblages by artefact hunters in the first place – quite obviously the only yardstick by which we can measure ‘PAS success’ in mitigating the damage caused. Hardy produced some numbers and you did not like them. That's why you (plural) wrote what you did and in the way you did. And no, you (plural) do not so much show that there is a better methodology, but merely snipe at what he did, and throw up side issues as padding and a smokescreen dragging discussion off in different directions to avoid focusing on the one, uncomfortable point, which you try to dismiss, but do not quite manage it (and it’s not the one that you misidentify as Hardy’s ‘purpose’). Again - as I can say after a decade and a half engaging with them – this is a typical metal detectorist strategy. A number of the issues you raise show that the six of you did not check back after you drafted it with Hardy’s text, to see if he did write what you impute. I did, and in several places you in fact totally misrepresent what he actually wrote. Yours thus become ‘emotive arguments’ (p. 322) rather than what one would expect as the joint product of several university academics and museum professionals. You claim on p. 323 that your (plural) text is "not a defence of 'liberal' approaches to Collection-Driven exploitation of the archaeological record", yet on pp 328-30 of your response, that is precisely what you do. Section 5 has NOTHING to do with what Hardy wrote, but everything to do with justifying maintaining the status quo. It is you [plural] that 'mix cause and effect' (p. 327-8) when it comes to the UK and US legislation. What you call 'metal detecting' developed within pre-existing legislative formats, and those forms did not 'arise' ... 'in contexts where metal detecting (sic) is openly and widely practiced' (p. 327). And – in a transnational context - legality is not just about ‘reporting’ (p. 325). Again, your approach is object-focused, while the core of most of the legislation you discuss is concerned with protecting ‘places’. This text that has been belatedly added to the pro-collecting stance of the majority of the other ones in that ‘Topical issue’ collection two years after the deadline simply reinforce the impression that, as the sand washes from beneath your feet, you are more keen than ever to prevent any serious discussion on this topic, rather than properly engaging with it in any broader context. 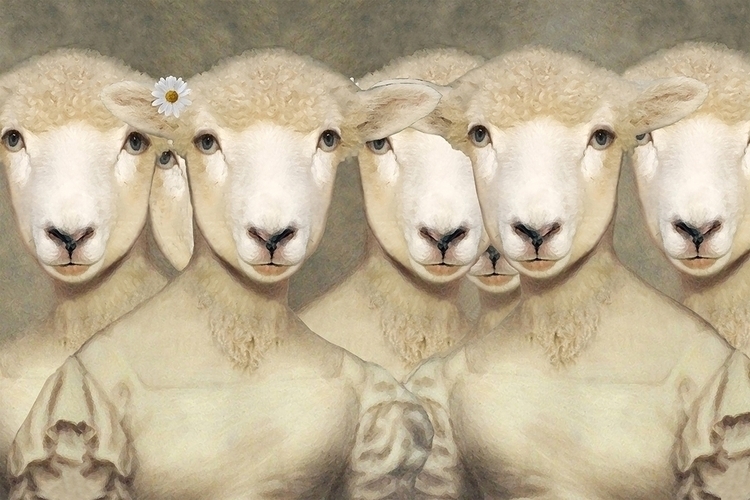 You call Hardy 'biased' on p 322 and 331, but nowhere justify that statement, neither do you show that the six of you are in some way 'unbiased'. I would say the tone and content of this 'response' illustrates very well indeed the specific position from which it is written - and that has nothing to do with Hardy's text and conclusions, but is primarily concerned with buoying up your own preferred model, the one your volume of collected papers promotes, and trashing any evidence that this is not working the way in which it is claimed to be. Prove me wrong, Mike, and commit yourself to working with fellow author Dr Ferguson's TTU (part of the 'organisations and national and local authorities responsible for engaging with metal detectorists') [CCd here too] to do what you and your five colleagues agreed is 'the way forward' (p 331), through ‘ground truthing’ (after already twenty years of PAS liaison and partnership with artefact hunters and collectors), and proper research by your own 'flawless methodology' to provide more reliable 'quantitative analysis of metal detecting for cultural property' (ie Collection-driven exploitation of the archaeological record). Can you do that? Commit to stop sniping at those of us trying to raise serious issues and concerns ('detractors', the 'old perspectives', 'biased assumptions') and actually get stuck into providing proper useable information about the scale of the problem that has yet to be addressed (PAS 2003 aim five was about this, and you said a decade ago that you’d 'achieved' this - let us see). Replace the traditional PAS puff-statistics (wotta-lotta-stuff-we-got) that you’ve been boring us with for twenty years with something more holistic, incisive and substantive. Can you? I do hope also that when you do, this time you will not make pronouncements like that it is "fundamentally wrong" (p. 323) to say that collection driven exploitation of a site (for that, not 'objects' is what Hardy was writing about), ripping random diagnostic items of (just) metal out of the complex patterning of archaeological assemblages (I'm talking here about surface sites too) with inadequate record is damaging. Because you say you ‘argue’ it in the paper (p. 323), but in fact neglect to present those arguments. There are many of us who however are sure that to express concerns about this is not it is not a disproven 'old approach' or a 'biased assumption' that it is damaging sites the world over (that transnational approach). Just pop along the corridor and talk to your Museum colleagues worried about the damage being done by artefact hunters in post-'Revolution' Egypt, Syria, Iraq and Yemen for a better perspective on this (sic) 'old approach'. He won't of course. The contribution of these six authors quite clearly aims at blocking discussion of what Hardy said, rather than enabling it. 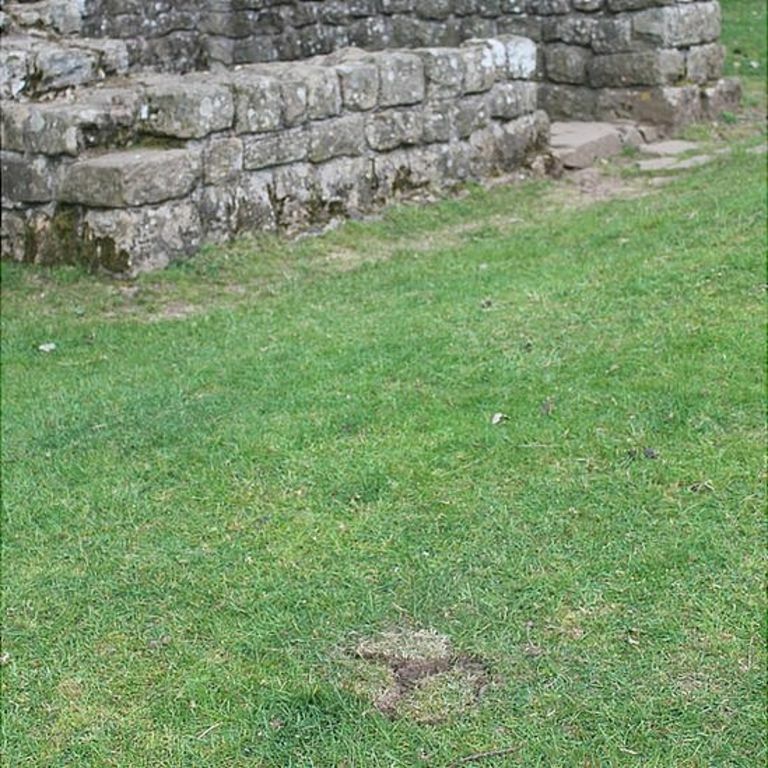 [..] metal detectorists are blamed for more than 50 holes found around the 1,900-year-old Brunton Turret section, near Hexham, Northumberland. 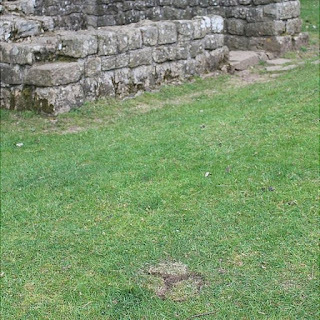 Historic England said those responsible were searching for loot such as Roman coins and military regalia. Other areas of the ancient wall, a World Heritage site, have been targeted. Historic England said it was working with police to try and find those responsible. But it added it was not practical to install security measures like CCTV along the stretch of the wall. 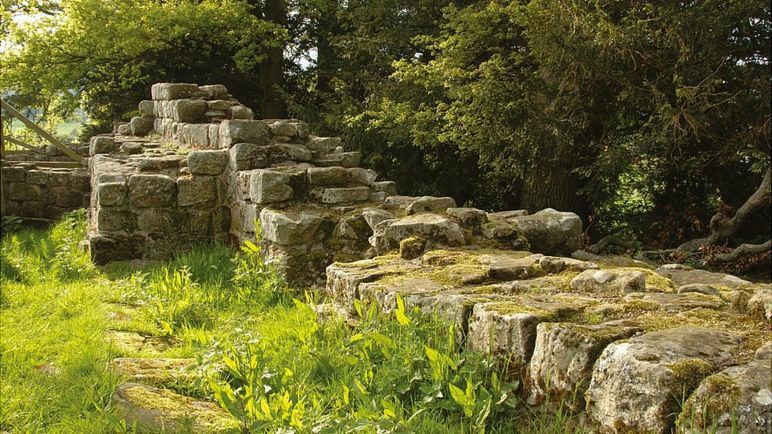 The 73-mile (117km) wall stretches between Wallsend in North Tyneside and Bowness on Solway in Cumbria and has about 160 scheduled monuments, which include Roman camps, forts and signal stations. Anyone using a metal detector without authorisation on these sites is committing a criminal offence. 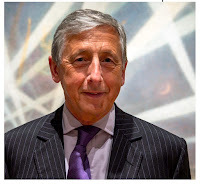 Mike Collins, Inspector of Ancient Monuments, is the one roped in to do the usual bit of fluff-talk "We know that the majority of the metal detecting community complies with the laws and regulations regarding discovery and recovery of objects from the land. "But the small number of people who steal artefacts and damage ancient sites [...]" Mr Collins might like to tell us how we know that. Can he? Or is this just waffle? How does he 'know' how many people do things they are hardly going to be bragging about? Again, how do we know that? No artefact hunter acting illegally in the UK has a collection of their own? That would be going against what we know of illegal artefact hunting in other countries. The upshot of what Mr Collins is saying is if we block those sales, we'll stop the majority of what he calls 'nighthawking'. Is that true? Dealers, what do you say about this? PAS, You got an Answer for This? "We may never see or fully understand the objects taken or damaged because they have been removed from their original sites with no care or record as to their history or context." 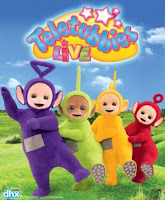 If we see them, can we 'fully understand' them? How can PAS recording 'magically restore' the information missing because it was not observed and recorded during the extraction of a collectable archaeological artefact (part of the evidence) from the context of deposition? Surely the answer is, it cannot. So, it makes no difference whether the object is removed by a trespassing artefact hunter or an artefact hunter given the nod by the owner of land on which archaeological sites lie, and whether the object ever surfaces in the PAS database, the information is still lost. No? No, PAS? Tell us more the public about it. Do some outreaching about this. It was one of your 2003 'aims' wasn't it? What you were funded to do. Yes. But when he is answered, immediately Mr Malony drags things down to the usual personal level and football-hooligan taunting that tekkies apparently love. This is quite interesting as a drop in numbers of incidents at precisely Corbridge was not so long ago used as 'evidence' that the PAS was (somehow, it was not explained how) responsible for an alleged 'drop' in illegal artefact hunting. "metal detectorists good, nighthawks bad"
To be fair, they are (I assume) unthinkingly parroting the BBC headline to which they link, but it should be archaeologists informing the media about how to talk about archaeological matters, not taking the line from uninformed journalism. So for both RESCUE and the BBC, it is not some people who use metal detectors to exploit the archaeological record merely as a source of collectables doing something wrong and illegal, but a specific group of people who use metal detectors to exploit the archaeological record merely as a source of collectables. I do not follow the logic of this form of labelling for two reasons. The first is that if an archaeologist was convicted, for example, of sexual abuse of an employee on an excavation, would it be reported only after adding an adjective ('law breaking archaeologist') to stress that not all archaeologists are sexual predators? Because this is what is happening here. Secondly, the assumption behind such people-labelling is that 'metal detectorists' never 'nighthawk' and all 'nighthawks' only 'nighthawk' and never 'metal detect'. But a 'nighthawk' could equally well have 'permissions' for several productive sites. Not only does this give them more opportunity to actually practice their hobby of 'metal detecting', but also to find collectable (or saleable) stuff. It also acts as a 'cover'. He can produce papers to show that he has permission to be on several sites, any one of which he could claim is the 'source' of an item the ownership of which has been challenged. Until nobody asks to see a finds release protocol from that specific landowner for that specific item, nobody would be any the wiser. Surely, is that not in fact the safest way to get away with nighthawking? In reality, the guys who dug holes in Hadrian's Wall, may well have also reported items to the PAS in several counties, they may have taken part in legal rallies and queued up at the PAS finds desk, or gone to one of the dealers' tables while there. The term, used as a differentiator (ie as used by Rescue News) is meaningless as a category, but its function is clear, to separate the 'bad guys' from the mass of 'metal detectorists'. But as I have pointed out, such an attempt may be producing a false and over-simplified picture from a much more nuanced reality. Can RESCUE contemplate that and changing the way they talk about collection-driven artefact hunting which erode the evidential value of archaeological sites and assemblages whether it is done legally or not? "But they fill in there 'oles, so wassthe problem M8?" In the case of Unpapered Artefacts Without Documented Collecting History, 'Who Knows?' Caveat Emptor. When we sent this picture to five independent experts, all of them questioned the objects’ authenticity. Although the specialists said they could not offer a definitive opinion based on a photograph, all of them expressed grave doubts. Four of these six (not five) specialists are unnamed, so it is not clear in what their specialism lies, one says he 'cannot imagine where a terracotta life-size horse head could come from in antiquity', a second decided the horse and a bull head were 'crude copies' and a third questions the value assigned to the seized artefacts, and in the case of the vase on the far right, 'The background colour is suspicious as well as the shape of the vessel. There are subtleties in where the handles are placed, the shape of the vessel as well as the foot, which are giving me pause for thought'. A fourth also had suspicions about the two vases shown as well as the larger terracottas ('but they are good quality. As I understand it, the Italian forgers [are] some of the best'). One thing they do not mention, to judge by the way they are propped up with grey boxes, neither the bull head nor the horsey one seem to have been mounted in the collector's original display. Why not? 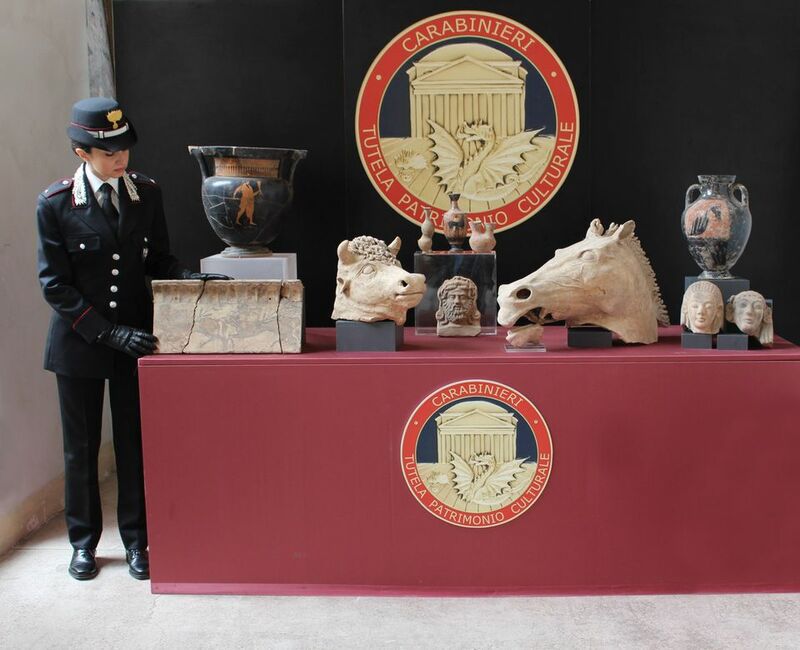 I think the newspaper is trying to limit the damage done to public opinion about the antiquities market by this sort of seizure, but instead with that 'who knows? ', they've done another kind of damage. How can you trust a dealer's opinion if six specialists differ so much in their opinion based on the same evidence? How much of what a dealer claims about an artefact they are trying to sell is substantive information, and how much just guesswork and humbug? 'According to reports, security forces stopped a vehicle arriving from Istanbul with five passengers upon receiving intelligence. After conducting a search, the gendarmerie found the Torahs hidden inside a loudspeaker in the trunk. 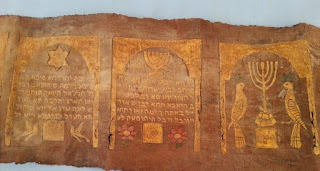 The Torahs were reportedly written on gazelle skin and were embellished with emerald and ruby decorations. The suspects were planning to sell the ancient books and were headed to meet the buyers. Bilecik Museum Directorate officials noted that the exact date of the Torahs will be announced after examination'. One feels they'd be better advised checking whether the seized items are authentic and not tourist bazaar fakes before they report their 'success'. 'Any input to any of the vellum pages of our Codex by a reader would be most grateful (sic), please any useful comments or corrections can be send directly to me at owenfelix2@gmail.com We here at felixrarebooks.com would appreciate all the help we can get, to decipher this unique Codex'. Good luck getting your money back! Mr Felix disappeared his video. And what did he do with the 'rare book' and where did it come from? We can only guess. Also having asked people who know more about these things than he seems to know to give up their time and give an opinion, a 'thank you' might be appropriate. It seems rare book dealers can exhibit the same level of behaviour as some antiquities dealers. 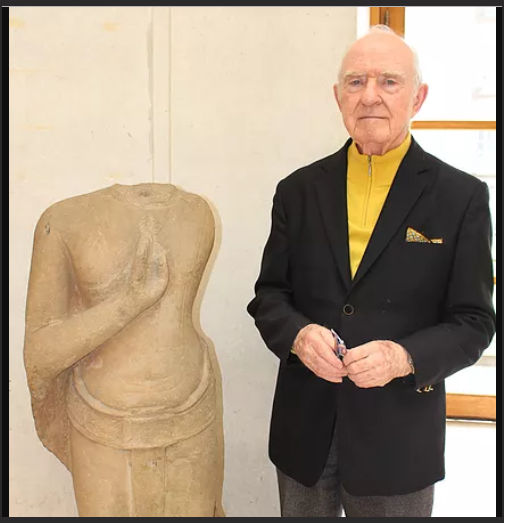 The SOAS has denied claims the prestigious institution possesses a 13th-century sculpture likely smuggled from Thailand “We strongly reject any suggestion that SOAS University of London has handled this donation improperly. The allegations made in the blog post by this student are without foundation,” SOAS spokesperson Vesna Siljanovska told The Nation by email. Siljanovska was referring to allegations made by SOAS scholar Angela Chiu, who had accused her school of accepting the one-metre-tall Buddha statue that stands at the entrance to its Brunei Gallery. It was gifted to the SOAS by American alumni Mary and Paul Slawson who reportedly bought it minus documents attesting to its provenance some 30 years ago. But in any case, there is no ICOMOS Red List for Thailand (!). On 12 March, Mr. Slawson sent Mr. Hollingworth a letter which states that the sculpture was purchased in 1985 at the “Ormond Gallery on Portobello Road,” the staff of which was “not aware of the exact origin” of the sculpture. (p. 1) [...] On 12 March, one working day after his meeting with the Slawsons, Mr. Hollingworth informed SOAS Development staff about the donation so that they could begin the process of due diligence and documentation. (p. 23) Thirteen minutes later, Mr. Hollingworth emailed the Slawsons that he was in touch with art moving companies about the transport of the sculpture; by the end of the day, he had scheduled it for 3 days’ hence. (pp. 8, 9, 36) Thus, even as the due diligence process had hardly begun, Mr. Hollingworth was already proceeding to take possession of the sculpture. Thailand is a notoriously looted country. This heightens concerns about the antiquity in question having no documented provenance. Also, stone Buddhist sculpture of the Lopburi era (13thcentury) of this size is rare. This is an artefact that should have been treated with great cautiousness and sensitivity. Owning a piece of antiquity [i]s seen as demonstrating wealth, a love of ancient culture and, ultimately, one’s own distinction: having things that nobody else could have. At least this is what the looters th[ink]. We should now all know the most apt way to describe this dubious form of collection – and it’s a word that has historical resonance: vandalism. [...] the antiquities trade is still going strong – not only depriving countries of their heritage, but, which is worse, depriving the world of the information that could be extracted with appropriate systematic excavation and reducing the artefacts into mere art pieces [...] Meanwhile, there is evidence that revenue from the sale of stolen antiquities looted in Syria and Iraq has been used to fund Islamic State and other terrorist groups – so one illegal activity has been connected to many others. Fighting the trade How are we to stop this trade, which is a scourge of historical knowledge, local pride and international sovereignty[?] 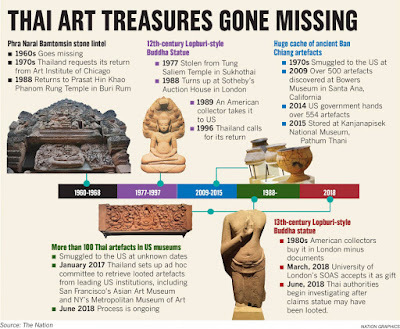 The illicit trade in antiquities – and almost all trade of antiquities is illegal in some sense, as it almost always breaks the law of the source countries – is considered to be a common crime. We have just had the great pleasure of acquiring a large collection of artifacts and we off[er] this unique treasure to you! We have bought from various auctions and collections from around the world and now we offer these rare items to you. NOTE TO EBAY: This item is NOT NATIVE AMERICAN and has been in a collection for over 75 years We are members of an Archaeological Institute We are members of an Archaeological Institute and studied in Israel and the US. So CHECK OUT OUR OTHER ITEMS. [...] Buy ancient artifacts from Egypt, Rome, Judea, Greece and other Tribal artifacts and weapons from around the world. All our items were collected prior to 1970 and come from private collections. All are acquired legally. Buyer pays shipping AND handling as noted in the ad unless otherwise stated, and international rates will vary and be determined at the close of the auction. We cannot insure outside of the US. Any insurance claim will be initiated and completed by the buyer. [...] COA: This fantastic artifact comes with a Certificate of Authenticity (unless otherwise stated) which is our guarantee GUARANTEE: Our items are guaranteed, and with us, you can buy with confidence. Collecting is a great hobby, and we want your experience to be a joyful one. Our buyers can count on a 100% money back guarantee. 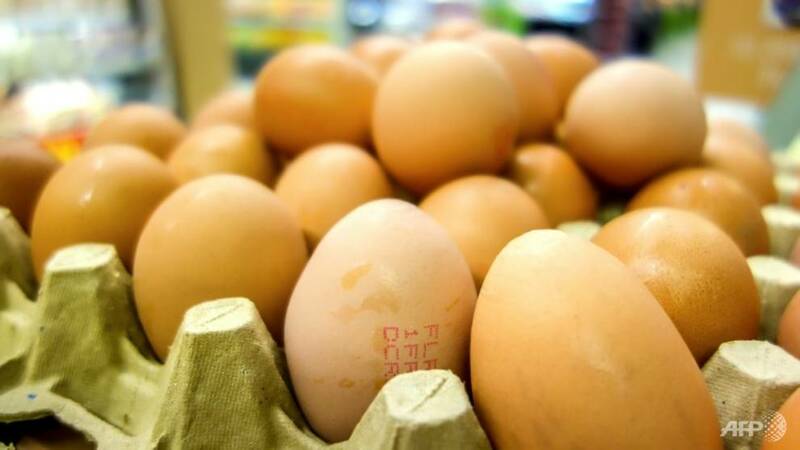 We pride ourselves in selling the best product available. An example of their wares is this object sold together with a surfeit of exclamation marks: WOW! STONE AMULET! ALIEN? ANGEL? GOD? DEMON? 5000 YEARS OLD! (401547691752) sold for US $36.00 [ 11 bids ]. A GREAT ONE! [...] WE OFFER THIS EXQUISITE TREASURE TO YOU! 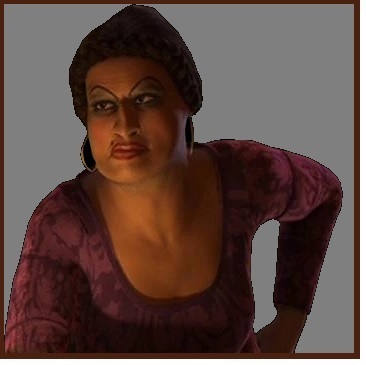 [...] Looks to be Asian.... I have also heard Babylonian. It appears to be made of jade or some other hard stone. I have seen similar on TV Ancient Aliens show! I have done some research and similar to those found in Inner Mongolia...mysterious ancient culture with a history connected to ancient alien theories DATING: Early Bronze Age, 3000-2000 BC! This one measures about 2 1/2" tall and 1" wide BEAUTIFUL WOW! This artifact would be a wonderful center piece to any collection. DON'T MISS IT!! The Mongolian Bronze Age in fact extends from ca. 2500–1500 BCE. All the 'Holy Land' objects (3) on sale at the moment are dated to the 'time of Moses' , the 'Indus valley' (3) bowls from Pakistan are not ascribed to any culture, there are a few generic 'Egyptian beads' and a 'Coptic cross', a US side-notched spear point (not assigned any country or culture of origin), and this 'alien' thing. What kind of collectors are buying these objects and what do they do with them? Where will they end up and in what form? PAS Database: how many lies? very large degree of error in PAS based PhDs"
This week, Heritage Action ask about the reliability of the second-hand 'data' supplied to FLOs which make up the PAS database. Despite this question being raised many times before, no attempt is still being made by the PAS for verifying the reported findspot of the finds they record (such as by demanding to see a finds release protocol signed by the landowner for any reported item to show the legitimacy of the finder handling the find in the first place - and thus the legality of their own use of these data). Why not? Is the farmer aware of what he has let leave his property? PAS a copout replacing real public engagement? Is reconciling society and museums really just a matter of encouraging members of the public to buy a metal detector and create their own collections as the British Museum seems to think? Or is there a lot more to this question to debate (British Museum too) asks Erin L. Thompson ('Museums Should Consider Why They’ve Become Targets of Attack and Protest', Hyperallergic 11th June 2018). Most UK metal detectorists are white, aren't they? MOB So what does the inscription say? And this has 'what' connection with 'the Bible'? 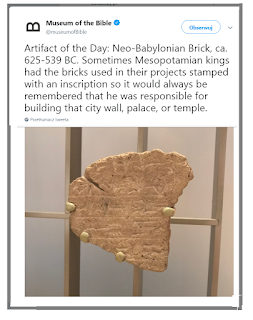 "bricks stamped with an inscription so it would always be".... possible to see where it had been illegally taken from. 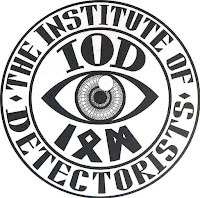 There's a new course being run at Rewley House, Oxford: 'Metal Detecting for Archaeological Projects: An Introduction' run by the so-called 'The Association of Detectorists', (but the runic logo used is of a non-existent so-called 'Institute of Detectorists'). The main tutor is Keith Westcott (artefact hunter - see here [HMS Ramillees is a protected site [UPDATE Mr Westcott insists that this site is not protected, so its OK to go diving there and poking around]) and the Director of Studies (sic) is Dr Alison MacDonald (Lecturer in Archaeology at the Department for Continuing Education University of Oxford). The course's title seems to me to be suffering from the usual British problem of not being able to name a spade a spade when it comes to artefact hunting and collecting. What is 'metal detecting'? The name is used in the UK euphemistically and non-euphemistically to mean several things, not all of which have a place in an archaeological project. One wonders why the course was not named in a more explicit manner (see below for one probable reason). Of interest to the detectorist and archaeologist, this course looks to explore how the metal detector and detectorist practitioner, can become an important element in the processes of archaeological mitigation. We will evaluate how ‘stratigraphy’ and ‘context’ relates (sic) the ‘Code of Practice’ through to an understanding of archaeological investigation and recording in the planning process. We look at typical documents such as method statements and the Written Scheme of Investigation, to what will be required and expected of the detectorist when on site and further preparation and reporting for pre and post site attendance. This introductory course will cover specific survey methodologies such as PDAS: Partial and Detailed Artefact Surveys and will be the precursor to further courses that focus on the embedding of metal detector use into professional practice. 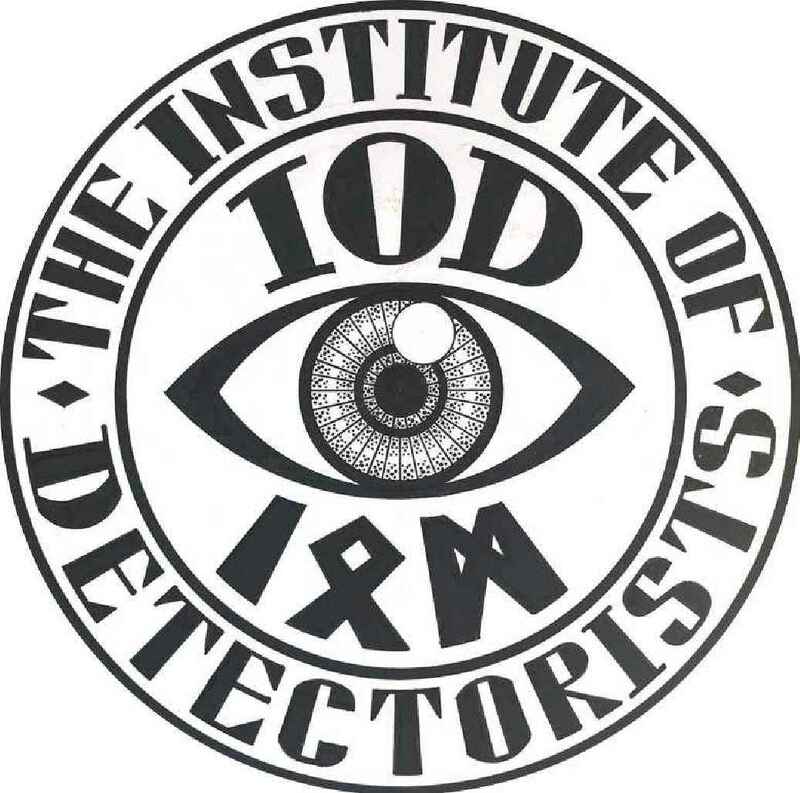 With the intention of becoming a Research and Educational Institute, the Association of Detectorists have been establishing the body over 18 months with overwhelming support from archaeological and heritage bodies and institutes. Our aim and mission is in developing a nationwide educational program based on archaeological and conservational principles, we look to encourage detectorists whose motivations are based in the research and preservation (sic) our National Heritage. With courses to enhance the ‘hobbyists’ awareness of ‘contextual landscape’ to the highest level of ‘consultant practitioner', which focuses on embedding metal detecting into professional practice and creating a UK ‘Bank’ of consultant detectorists, to assist on archaeological projects. The last sentence is a bit wonky. and what about: '11.30am Archaeological methods: the detectorists' prospective', eh? Come on University of Oxford, in proper English please. It may well be a surprise to the organizers that in many European countries, 'metal detector use' has long been 'embedded in professional practice' in both surveys as well as mitigation projects. 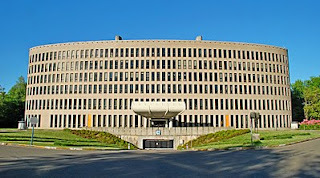 I wrote on it here in Poland in the mid 1990s. But this session is not really about the use of the tool itself (which is not dealt with at all in the session's programme) but getting recognition for 'detecting practitioners'. I'd like to ask Dr MacDonald to specify what, more precisely, is meant by that term, in what activity have these particular people become such expert practitioners, and in what way does that relate to the aims and ethics of archaeological practice (ethical issues are not in the programme either). Note the juxtaposition 'The ‘Code of Practice’ and ‘Treasure Act’' (why is that here anyway?) 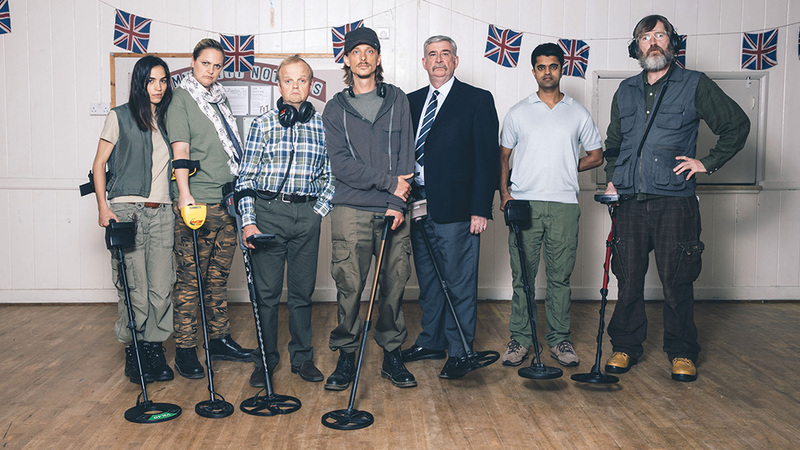 and 'What do detectorists want in return?' (ie for complying with them maybe?). 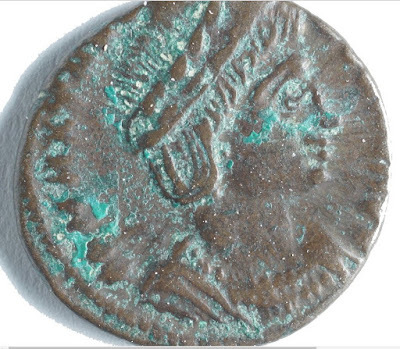 Will archaeologist participants be encouraged to go onto a detectorist forum or two to find out for themselves? I think if they did, they'd find that more enlightening than Mr Westcott banging on about 'bridge building'. To have a bridge you need foundations. What is the actual evidence from the social media of the existence of anything at all that could serve as a real foundation? Go and look. With reference to [and omitting the scare quotes] the proposed evaluation of 'how stratigraphy and context relate to the Code of Practice’, they do not. The current 'Code of Practice for Responsible (there's that phrase again) Metal Detecting in England and Wales' discuss neither, except to say leave them alone. On an archaeological project the stratigraphy and context need to be documented in the same way as for non-metallic information and certainly cannot be put in the hands of amateurs who've done a five hour 'course' run by a guy who cannot handle writing proper sentences. It figures that it is in Britain that we see (allegedly) 'overwhelming support from archaeological and heritage bodies and institutes' for the idea of establishing a so-called 'research and educational institute' for Collection-Driven Exploitation of the Archaeological Record (the proper name for the mealy-mouthed euphemism 'metal detecting'. Such an entity (run by Mr Westcott no doubt) would act as yet another smokescreen to obscure the real nature of the exploitative hobby that so many British archaeologists seem to support. I think it is they who are being exploited by the artefact collectors. Hmm, not being able to post a comment here is nothing to do with me or anything I have done. Try again Mr Westcott, many of your metal detecting mates seem to have no such problems, especially the abusive, foulmouthed ones. Can't keep these 'ambassadors for the hobby' away. I think there are a few things to cover in his intro. 1) I note the usual emphasis on the connection between Collection-Driven Exploitation of the Archaeological Record (CDEAR) and 'voluntary and charity' work done by its practitioners. It's like saying a mass murderer is not really a 'bad' guy, as he helps old ladies cross the road and loves animals. The two, Mr Westcott, are totally unconnected. 2) Some people will praise the mass murderer who helps old ladies, it does not mean that they are right to do so. Just because some archies praise some tekkies, it does not mean that all archies must think that all tekkies are doing the right thing, even when they are within the law. As an archaeologist with a conservation background, I do not think (and have the right and reason to think) that Collection Driven Exploitation of the Archaeological Record is in any way a 'good' way to treat that record. Furthermore I believe that archaeologists who say it is in some way a 'good thing' are wrong, whether they qualify that or not. I am prepared to argue that (and do here) that it is a huge problem, are they going to show me where I am wrong? They may 'praise' Mr Westcott (who's obviously eager for it), but they are not so eager to come up here and produce reasoned and substantiated arguments, which stand up in the wider context of archaeological practice, to say why what I say is wrong. The heads of all major archaeological bodies involved in the initiative will talk to Mr Westcott in private. 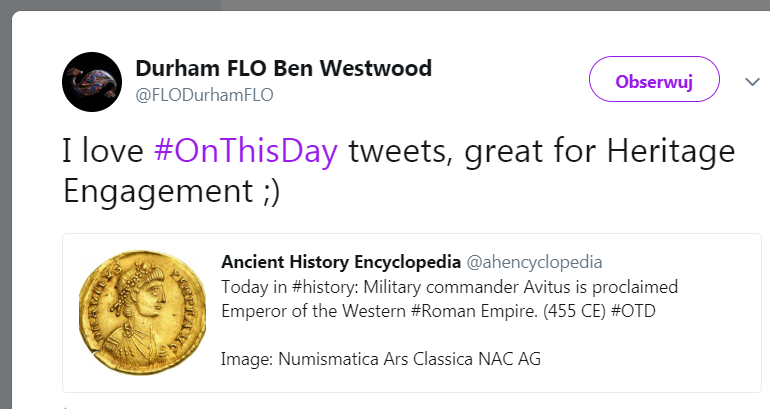 They don't really seem all that keen to shout out in public, still less in an archaeological forum, that looting (CDEAR) is OK. The scare quotes are Mr Westcott's. Why are they there? First of all I have been going on for many years about that label 'detectorists'. What does Mr Westcott mean by it? Because I think he means 'artefact hunters' , and the ones I am bothered about here are 'artefact hunters engaged in collection-driven exploitation of the archaeological record'. And what are they exploiting it for? Well, as anyone can see, most of them to build personal ephemeral collections of historical artefacts (especially coins). Now, I'd be interested to hear Mr Westcott explain to us all how somebody hoiking out and pocketing archaeological evidence which is merely treated as collectables/hedge fodder (depending on who collects what) is not doing it for personal gain. They are doing it to gain a personal collection of artefacts. And I do not care how many old ladies they help across the road, how much money they raised for disabled donkeys by their charity rally, or how many times they've used their machines on an archaeological survey in the meantime, it is the erosive collection-driven exploitation of the archaeological record they do in between times that is the problem. Getting that idea into a tekkie head should not require too much effort, I would have thought. I could be wrong. 4) Its a platitude to say that through 'metal detecting', valuable information 'can be gained from the discovery of an artefact'. We all know that, the PAS bangs on about it daily and has been doing so for twenty long years. 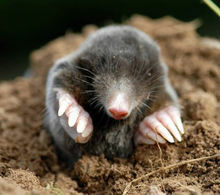 But in many cases (and sadly the metal detectorist hoiking it out blind from above in a spade-size hole) is not in any position to judge when it is the case and when it is not , valuable evidence would be preserved if a select collectable artefact which fits a detector's 'settings' were left in its burial context. In other words, equally valuable information is destroyed when an artefact hunter detects it and then digs it up and puts it in his pocket. Archaeology and archaeological inference building is not just about 'digging old things up' (that may come as a surprise to some PAS-supporting archaeologists). As the person behind the proposal to form an educational and research institute, I have looked to approach the initiative from the archaeologists prospective. I have discussed and shaped the proposal through meetings and in communication with CIfA, CBA, Historic England, PAS, ALGAO and other prominent archaeologists. The support I have received from the archaeological community has been overwhelming. I do need to emphasise though just in case there is a suggestion I have done something illegal, in response to your claim that HMS Ramilies is a protected site, I have specifically enquired with HER Devon and Historic England who confirm that it is not protected. In regard to the 'how stratigraphy and context relate to the Code of Practice’ the 2017 Code of Practice' states: If detecting takes place on pasture, be careful to ensure that no damage is done to the archaeological value of the land, including earthworks. Avoid damaging stratified archaeological deposits (that is to say, finds that seem to be in the place where they were deposited in antiquity)… My reference to a 'detectorist prospective' is to investigate how we can adhere to the code (I have asked a number of Heads of archaeological bodies their thoughts as its not straight forward). You mention the cost of the course. I have attended a number of courses at Oxford such as 'Stratigraphic Analysis in Archaeology' which cost of 3 times that of Metal Detecting for Archaeological Sites: An Introduction. The course is an 'introduction' as it will followed by other courses written by our Education Committee. (Prof. Chris Gosden has agreed to Chair). I have been motivated to propose the initiative due to my own concerns in how the interest has developed. However, I am confident that there are many detectorists who are passionate about conservation and preservation, I hope I can help by developing an educational program which is deemed useful to assist archaeologists. I apologise that my use of the English language is not always up to 'Oxford' levels, I know it’s a failing of mine and I will continue to try harder. PAS: Recording Finds is Good fer th' 'Obby Innit? 'Responsible Detecting', was is das? Pocketing Called 'Archaeology' and 'Survey'.